The challenge of the New Year, for Christians, is to grow closer to what God would have us be. During the last year we have, undoubtedly, clothed ourselves from time to time with the attributes mentioned in the above writing from Colossians. Practising them will help build community in this place and they are, individually, so different to much in modern culture that they will mark us out as different – in a good way. Here’s hoping that your and my practising goes well. We wish you all a Blessed and Peaceful 2019. Fr Mark, Judy Hopkins and Jacqui Nutt-Davies share news and thoughts about the shocking and saddening situation of homeless people in our communities. If you can, please donate your time, food or money to help. Find out more by clicking on the organisations’ names to go to their Facebook pages. Fr Mark - Nearly 600 homeless people died in England and Wales last year - a stark reminder of the misery of homelessness. Being homeless is something that, fortunately, I know nothing about. To know that you are going to live the day and the night without the security of a roof and a front door is something most of us don’t understand. However, we are being made acutely aware in the press both locally and nationally that this is life for a growing number of individuals. There seems to be no one single cause on which to focus in order to help. It is therefore with thankful prayer that we have partnered with Shalom Ministries who work with and for those who find themselves homeless in this place. They are using our redundant gallery at St David’s (photos above) to provide food, shelter, warmth and engagement with the homeless for two hours on a Monday and a Thursday. They provide, literally, an oasis in a fairly barren landscape. We thank them for their ministries and pray for the future. Other organisations providing vital support include Merthyr Homeless Outreach, Merthyr Tydfil Night Shelter and Providing Help to Merthyr Tydfil Homeless & Less Fortunate. Grateful thanks to all. Judy - Most people have an idea what it would be like to be a ‘rough sleeper’, that is, someone who has no place to spend the night and finds a place to ‘bed down’ night after night. I decided to experience a night in the open after talking with some of Merthyr Tydfil`s homeless people and getting bitterly cold and being told the Night Shelter would not be available until January. On Sunday, 3rd December at 10.00pm I was ready with my bed of cardboard, a blanket and sleeping bag to spend the night in the grounds of St David`s Church. I had plenty of warm clothes which would keep me warm. Ian was spending the night in the car, nearby, but was not to help me except in an emergency. Paul Hughes came to help me set up and Viv and Lynda Price came down with chocolate bars and crisps. Councillor Geraint Thomas, too, came along to give his support. It was very kind and thoughtful of these friends and others who telephoned me beforehand to wish me well. Most of the goodies which Lynda brought had to be declined as I didn’t want to have things that the homeless wouldn’t have. It was a mild night with showers of rain; I was grateful for this, probably I would settle down quite easily. At about 11.00pm, I was wishing I had a bottle of sherry to numb my wandering thoughts and help me to fall asleep. No such luck; nothing to eat, nothing to drink. After all, where would a homeless person get a drink after closing time? The lights from the library carpark gave me some comfort but I couldn`t get comfortable and the thoughts going through my head were keeping me from sleeping. I was also concerned for Ian – after all, he didn’t choose this idea but he wouldn`t let me be out on my own. What if someone approached the car? What if someone came along and asked me for something – who knows what? Would Ian be alright? What would I do? I had my whistle, torch and phone at my side, would they be enough? Occasionally I got up to check that Ian was alright, sometimes he was dozing (he didn`t see me at the window of the car) while other times he was reading a book. As time went by, it started to rain heavily and the wind rose, causing my cover to blow and make the rain come into my space. Now there were strange unidentifiable sounds, sounds of voices still heard a little way away, coming nearer and then disappearing – will they come near me? They didn`t but I was very glad I hadn`t chosen a Friday or Saturday night. Lots of shouting at this time, although it was well past midnight; were the pubs still open? Still some strange sounds and the wind was getting stronger. Were there any animals about? Fortunately I didn`t see any rats or mice nor even a stray cat. My eyes were heavy now, perhaps sleep would come soon. The wind was still blowing the covers. The feeling of confidence that I had felt before leaving home had gone. I had a feeling of nervousness; it was scary and very eerie. I started to feel cold, but with all my warm layers, I’d probably get no colder. I wondered how many people were still about. Would there be any homeless people nearby? This was no fun, I was longing for a warm drink and something to eat. Wondering what sleep I would get – probably none with all the thoughts racing round inside my head. What about all the empty buildings in Merthyr Tydfil? Could suitable unemployed people be given an incentive to “man” the Night Shelter sometimes? Until now I thought I could manage this experience easily. How wrong I was. Did the homeless carry any food with them to keep hunger at bay? Perhaps they stole food. Could anyone blame them? It was horrible. I was so lucky to have Ian nearby; I looked through the window of the car; he may be dozing off occasionally but at this time he was reading. He looked ok but he didn’t notice me. The rain had stopped and the wind had died down. There was a partially clear sky where three stars were visible. If Ian was with me he would have been giving me an astronomy lesson. The times he used to explain all the stars to me while I`d be freezing with teeth chattering when we`d been out for an evening before we were married. People have been telling me for some time that I should give up some of the things I`d done for years. Hmmm. I`ve given up some things and what happens? God has moved me to undertake this experience – I would never have thought of doing it. Thankfully my faith must be strong because I knew He was watching over me and would keep Ian and me safe. A prayer I prayed: May the Holy Spirit guide all the volunteers, including Mothers’ Union and our parish to help the homeless in whatever way they are able and may the homeless be encouraged to seek the help they need to overcome their problems. May we be helped to understand the vulnerable and may trust grow between us all. Homelessness is a very complex issue and it will take ever so much to improve the lives of these vulnerable people. How do these people get by? How much sleep do they get? By this time, this was about 2.30am, all these thoughts were in my head. I was getting colder and I was so uncomfortable, sore and aching. This must have been my lowest point. The rain had started again and the wind had risen. More strange noises around the place. I took some photos to do something and for proof that I was sticking it out. No way was sleep coming to me; some relaxing exercises and breathing exercises did not help. Round about 4.00am (I kept looking at my watch to see how the time was going) traffic seemed to be moving again. So far I’d managed not to want the loo – I hoped I could last until 6.00am. Traffic and people`s voices resumed as the world was waking. I thought how strange similar noises can have different effects on me. These sounds now were a comfort to me although it was still dark. The end of my ordeal was in sight. Ian had been amazing, just being near me and not trying to persuade me to give it up. Please don’t let him suffer any ill effects. No need now for my whistle, torch and phone which I’d had in my hands or very close to me all night. I wonder if they would have saved me in an emergency. It was approaching 6.00am when I hoped the rain would ease off so I could gather my things together, get them inside and go home to a hot bath, breakfast, a hot drink and a sleep in my lovely, warm, comfortable bed. I want to thank everyone who called me mad but supported me in so many ways - the sponsorship which has raised over £600, thank you Jacqui for suggesting that; Paul for helping prepare my ‘bed’, Viv and Lynda for coming with some goodies. Sorry Lynda, I didn`t want to seem ungrateful not accepting all that you offered us. By the middle of the night I was wishing I had! Reverend Charlotte has been a strength to me. For the phone calls and texts before and after from friends. Thank you all so very much and most of all, Ian, who, once he knew I was serious about doing this did not try to stop me although I knew he would have loved to have heard me say “I can’t do it”. If only the vulnerable homeless people could have as much love as I have received this week “what a wonderful world this could be”. Finally, a thought-provoking and heartfelt poem by Jacqui Nutt-Davies. about the way we celebrate His special day. of chocolate, wine and the like. Or the vast amount of money we spend on gifts that are overpriced. Would he laugh as the panic sets in to put up the Christmas tree. And clean the house because you never know who might drop in for tea! After all we are celebrating His birthday. Not trying to spend all we've got. Maybe it's time to stop and think what Jesus would want us to do. because of the wonderful things He can do. But hasn’t he taught us to help those who are struggling in many different ways. The sick, the injured, the lonely and those who have nowhere to stay. So this year shouldn't we lower our spending on those who already have lots. and spend time with the lonely and lost. By giving some real Christmas cheer. 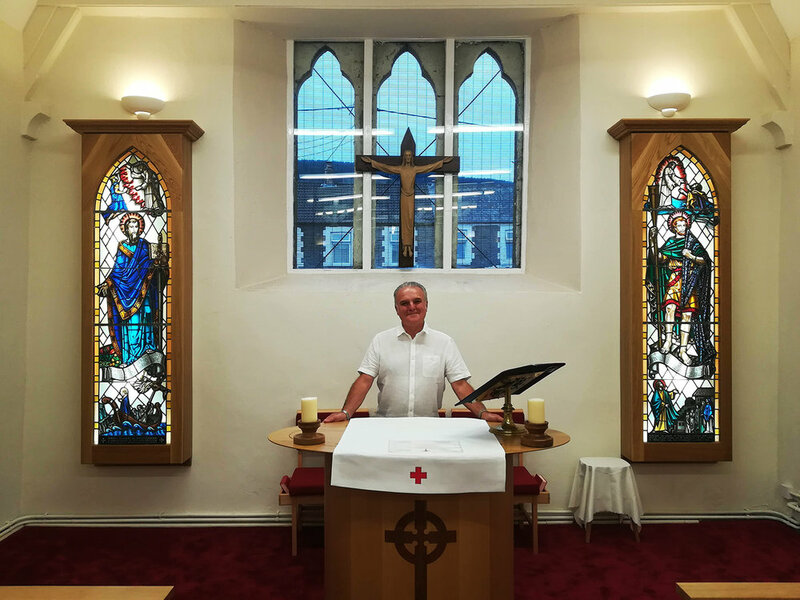 Andrew Griffiths, a former chorister at Ss Peter & Paul Abercanaid, tells us the history of the stained glass windows now housed in the new Worship Centre. Thank you, Andrew. “The history of the two stained glass windows depicting St Peter and St Paul, and now installed in the rededicated church of Ss Peter & Paul in Abercanaid, goes back to the early 1960s. They have ties with my grandmother Gwyneth Symonds who lived in Cardiff Street, Abercanaid and who was a staunch member of the congregation. The windows were made by J Wippell & Co Ltd in Exeter and are of outstanding quality and craftsmanship. They were commissioned in 1964/5 by my American ancestors Forrest Williams Snr of Chicago and his sister Vera Riggs of California. Forrest’s parents William John Williams and Mary Ellen Williams lived in the parish, in Old Penyard, and when Forrest was just a baby, the family emigrated to the USA where Vera was born. William John Williams and Gwyneth Symonds’ father were, I understand, cousins. The window depicting St Paul was given by Forrest Snr and Vera in memory of their parents. The window depicting St Peter was given in memory of my grandmother, Gwyneth, by my grandfather Leonard Symonds, a member of the choir of Ss Peter and Paul, and our family. Both windows were installed behind the font in the “old” church in 1965 and there is a photo of me, then a chorister, standing by them. The windows were removed from the “old” church after it was made redundant in 2009. They have been lovingly stored and subsequently prepared by Tim Lewis, Glantawe Studios, and are now presented in English oak backlit cases and feature in the sanctuary of the new Worship Centre. It was a privilege to be invited to stand at the altar at the rededication ceremony; the two pictures are taken 53 years apart. On the 9th October 2018 Reverend Mark Prevett was licensed by Bishop June as the Priest in Charge of Merthyr Tydfil Christ Church whilst remaining Priest in Charge of Merthyr Tydfil St David and Abercanaid. It was a very enjoyable service with a large number of the congregations from both parishes turning out to support this new beginning and to listen to Bishop June sharing her aspirations for a Diocese that is ‘up to something’. We pray, with her, that in this place we can; ‘Tell a Joyful Story’, “Grow the Kingdom of God’ and ‘Build our Capacity for Good’. They say that you should never work with children or animals. I’ve just found out why - ‘cause if you do you have the best fun ever!!! We have just had a weekend playing, worshipping and praying with children and animals and it has been an incredibly uplifting experience. 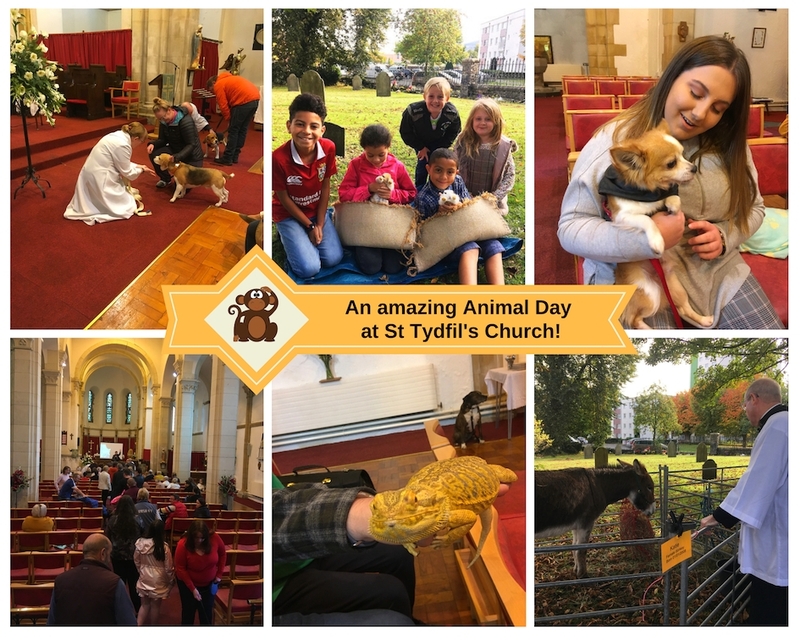 St Tydfil’s has been full of many different sounds from singing and cheering, to food and drink being consumed, to a barked greeting and the silence of an ever watchful bearded dragon. It has been ALIVE and it has left those who participated feeling alive and thankful for all of God’s creation and His gifts to each and every one of us. Special thanks to Rev Charlotte and her team who worked so hard to make this all come together, to Hayden at Nanty-y-Coed Farm and Alan from Owls 4 You for providing the icing on the cake. See our Facebook page for lots more photos. 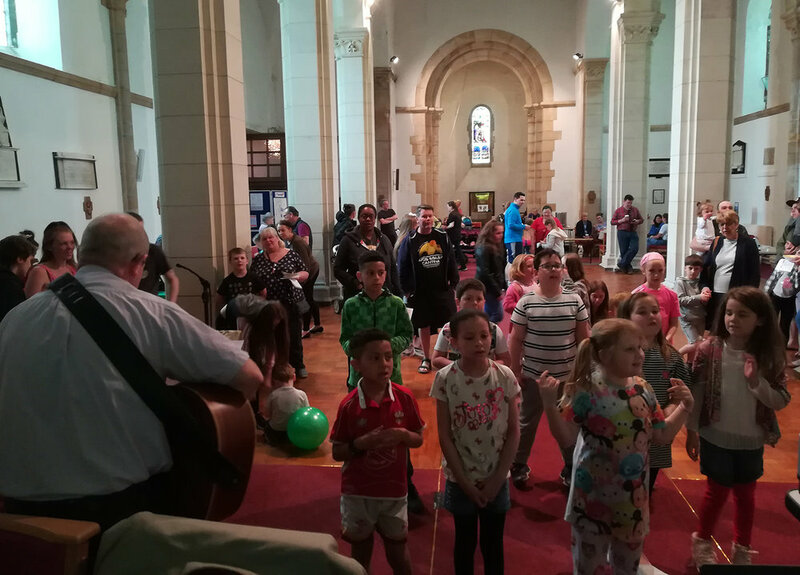 Fr Mark writes an open letter about his appointment to Merthyr Tydfil Christ Church and the many opportunites and potential this brings to ministry in Merthyr Tydfil. "Most of you are, I suspect, by now aware that a couple of weeks ago I was appointed as Priest-in-Charge of the above parish as well as remaining Priest-in-Charge of Merthyr Tydfil St David and Abercanaid. It will mean that I am half-time in both parishes for a while but will, hopefully, be enabled by some lovely colleagues in both parishes as well as our curate Charlotte. I need to be very honest with all concerned and say that I did seek this appointment in the genuine belief that it was the right solution at this time. I am anticipating that it will mean an increased work load for a period of time but I am very excited about the potential for us all to be working together for the future of God’s kingdom in this place. Each parish has a lot to offer and they can certainly receive from each other. The journey of learning and growing, accepting and embracing, challenging and adapting will be refreshing for us all. It is hoped that in the not too distant future we will be able to invite a colleague to join us working across the whole area bringing new insight and expertise to our ministry in Merthyr Tydfil and its surroundings. That is very much in God’s hands, but on earth the Area Dean, the Archdeacon and the Bishop are very much behind our thinking. They are very encouraging as well. There are some adjustments that will have to take place in the very near future. Our Sunday Morning Service times will have to change for some. No one likes change but if we accept these things and think not of ourselves but of the future of the church, good things will be enabled to grow. There are two reasons that we need this change. One is purely practical; in order to cover clergy holidays / sickness one clergy person always needs to be able to cover two services on a Sunday morning. The best times for this seem to be 9.30am and 11.00am. The second is that when clergy are not on holidays or absent for other reasons it provides what I call ‘room for manoeuvre’. Clergy have time to do other things that help the church and us to grow. One example would be that a clergy person could go out with the Young Disciples at the Quar. Another would be to run a Café style church in the afternoon. And yet another would be to run some training initiative on a Sunday afternoon or evening. In Merthyr Tydfil St David and Abercanaid we have already experienced the change that having two clergy with lighter workloads can make; how we have been taken forward so far and so fast in Charlotte’s first year. Imagine what might be achievable with yet another person in full time ministry. It will be just one month short of my having served here for five years when I am licensed to Merthyr Tydfil Christ Church and in those five years I have learnt a lot and made quite a number of mistakes. I shall continue on both those paths – learning and making mistakes, but in the long run, if we hold one another before God, forgiving, forgetting and seeking His will His Kingdom will grow. All I ask for is your patience and your prayers for all who are involved in doing their best to make this situation really work for the best. Bishop June will license Fr Mark at Christ Church Cyfarthfa on Tuesday 9th October at 7.30pm. All are welcome. ‘Quo Vadis?’ Peter asks Jesus on the road as he flees Rome. ‘Where are you going?’ ‘I am going to Rome to be crucified again’ replies Jesus. And from that encounter Peter gains the courage to continue his ministry and returns to Rome. 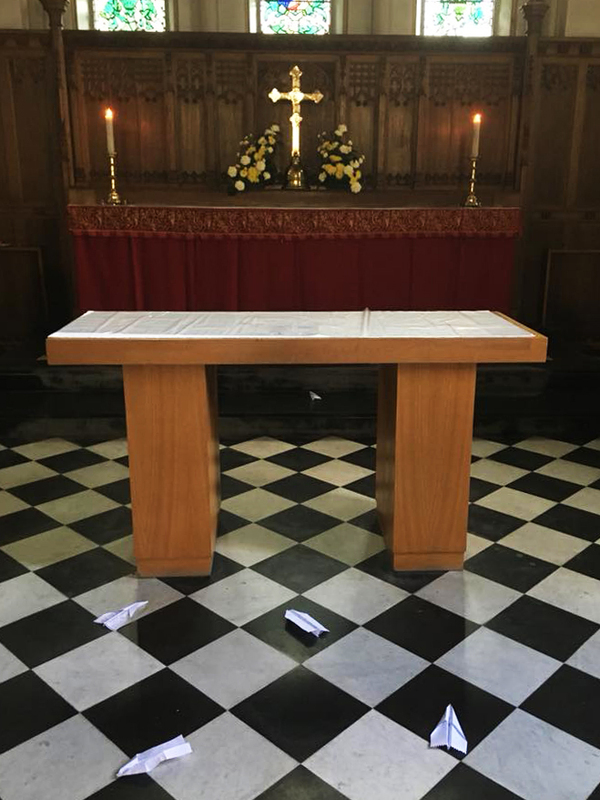 ‘Quo Vadis?’ is the question that Bishop June asked of us at the joyful rededication service at Ss Peter and Paul’s church in Abercanaid on July 11th 2018. We can certainly do no better than Peter following his encounter with Christ on the road from Rome. We can have the courage to continue our ministry to this area. The building itself is ‘fit for purpose’. Pretty well any purpose we choose for it. It is each one of us that must receive a fillip from the achievement of a long-held vision that gives us a multipurpose premises for the 21st Century. God can use this building, through us, to grow His Kingdom in the community. Our Open Day on 22nd September gives us an opportunity to show off and to share our vison for the future. This is a vision that can be seen in the practical, as in the car park we will have, but also in the development of the spiritual, with the building being used for groups that come to meet and then to pray. 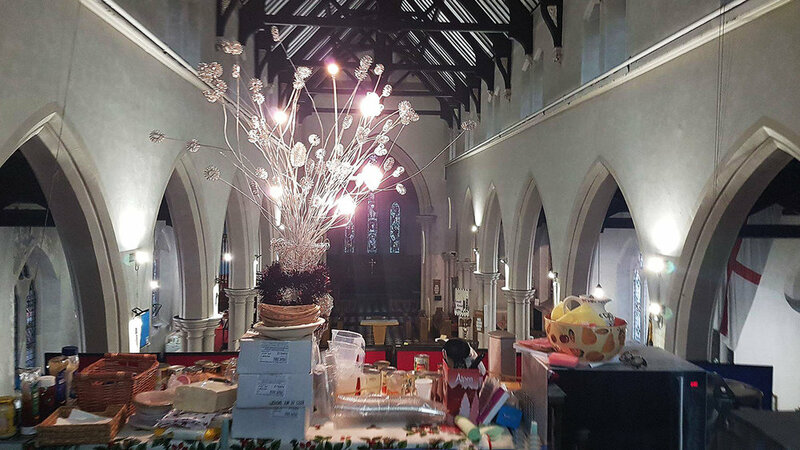 For me there is this lovely image of the worship space, the God space, being right alongside any and every activity in the community space. This then, perhaps, answers the question that Bishop June asked of us. ‘Quo Vadis?’ - ‘Where are ‘we’ going?’ Walking, with courage, alongside our God in all he is doing in this place. Saturday 30th June 2018 was a very special day for the three new deacons and five new priests who were ordained by Bishop June at Llandaff Cathedral. Our very own Charlotte Rushton was amongst them and here she tells us about her day in her own words. “Following three peaceful days on retreat at Llangasty, the morning of Saturday 30th June had arrived. I woke at dawn - because who would want to sleep on such an exciting day - before departing Llangasty for a McDonald’s breakfast! After filling our tummies, we headed to Llandaff and to the Bishop's palace. Bishop June greeted us with coffee and flapjacks, and we had some quiet time with our families before the legal requirements were met. Everyone’s family went to the cathedral while we took our Canonical Oath of Obedience to the Bishop and received our licence to officiate. As the service started, I remember looking into the cathedral from the steps and feeling in awe of both the beauty of the place and the gravity of what was about to happen. As I took the long walk down the aisle to the nave, all I remember is seeing the smiling faces of the people of this parish, my family and friends. The ordination service was beautiful and emotional. I came away feeling blessed by God and given a clear ministry to fulfil by the Bishop. The evening saw the joyous celebration of my first Eucharist at St Tydfil’s Church. I honoured the Anglo Catholic tradition of this parish, while Fr Mark led us in some Evangelical worship! It was perfect. I feel blessed that the whole parish came to show their support and celebrate with me. Thank you to my friends Edward LeBrun Powell and Ian Hodges for assisting in the celebration and to the Rev Christopher Burr for his fun and challenging sermon and the kind words about me. And God bless you too Charlotte, we are so pleased, proud and fortunate to have you in our parish. 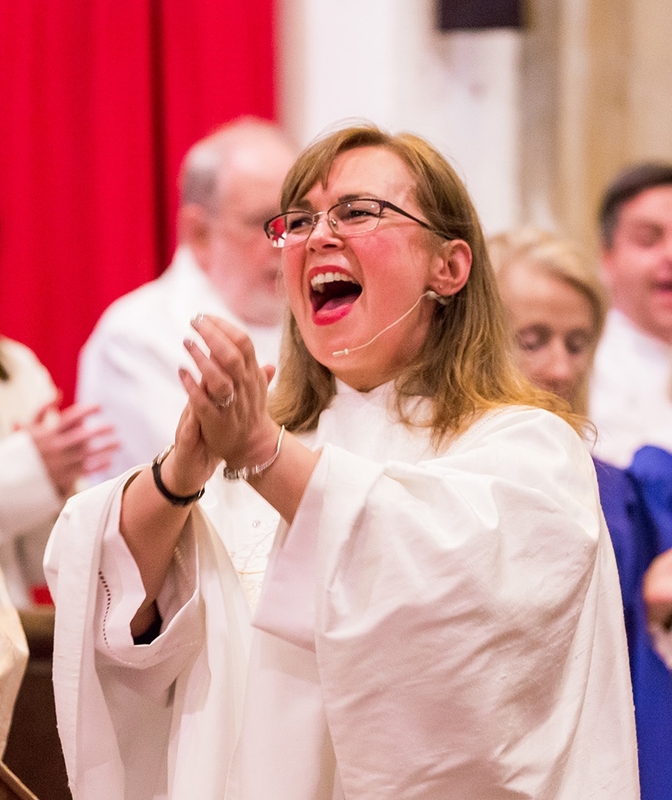 Many thanks to MLA Photography and Mike Komor for the lovely photographs.